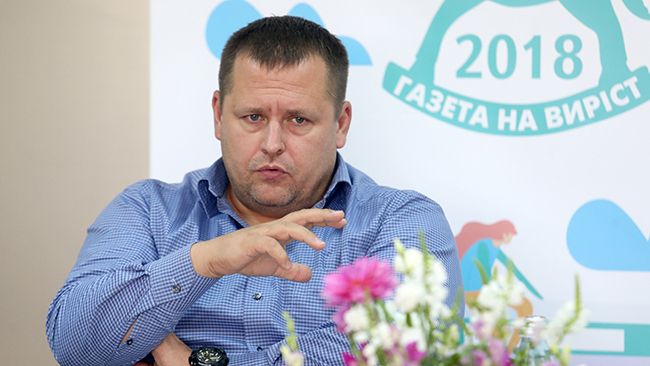 Mayor of Dnipro Borys Filatov, who came to Kyiv specifically to meet with students of Den’s Summer School of Journalism, discussed how to restore citizens’ trust in government, what issues worried residents most, and what the real powers and resources available to a mayor were. The students went to the meeting well-prepared. The speaker intended to have an interesting and productive conversation. The end result was in line with expectations. “The recipe is very simple. One needs to talk less and do more! We have an issue with the public. People believe that full responsibility lies, firstly, with the president, then with the governor, and lastly with the mayor. People do not understand the separation of powers and authority. The top leader is held personally responsible for everything. It is under such conditions that it becomes difficult to ascribe any achievement or defeat to the individual responsible. “In order to restore trust, one must first show work done. “When I entered the latest election campaign, only 5 percent of citizens aged over 50 trusted me. Now the level of trust and satisfaction with the work of the mayor in this age category is about 50 percent, that is, it has increased tenfold. The share has changed because people can have different general outlooks, but when they see work done every day – in their courtyard, on the street, on TV screens, on the pages of newspapers – they change their attitudes, including ones towards those leaders with whom they may be in disagreement on certain political issues. “We, I mean local communities, have received a serious financial resource after decentralization, which has allowed us to implement many projects. But when people talk about it, they forget about the hryvnia repeatedly and sharply falling against the US dollar. When funding is set against prices of materials and infrastructural projects, it becomes clear that we do not have that much more money. “A lot of problems have been accumulating for decades. Even taking into account the ‘massive’ budget of ours, it is impossible to solve these problems immediately, because despite the spending amounting to 14 billion, 10 billion of it are protected items: wages, welfare payments, etc. There are huge problems with water supply and environment. For example, nobody knows where and which communication lines lie in this city. We begin to dig and find pipes bearing Russian Imperial era emblems. To conduct an audit of underground communications, I need like 200 million hryvnias. “I await the election with dread because I am interested in the status quo being preserved since I am the leader of a local community, and I impartially discuss and raise in communications with mayors of other cities the fact that now the central government does not intrude much into the affairs of local communities. It is clear that the public opinion colors all administrations as equally bad. However, things are not the same as before at the level of the regional councils, the prosecutor’s offices, the Security Service of Ukraine, or the police. There are no required vote quotas, nobody invents designs aimed at getting mayors into a tight corner or forcing them to promote someone. There are, of course, many different speculations. I saw a TV channel, for example, broadcasting a story about Petro Poroshenko allegedly trying to force Filatov to support him in the election. But this is not true. When they begin to invent a conspiracy theory (which is interesting at the first glance) stating that Poroshenko came up with all that so that all mayors become loyal to him, it is total idiocy. “Therefore, we are satisfied with the status quo, because nobody hinders our work. It is clear that everyone has their difficulties: someone has quarreled with the governor, someone with local security forces, someone is disliked by the cabinet, so everyone has their own story to tell. But the situation has changed dramatically in comparison with the time when city mayors spend weeks in Prime Minister Mykola Azarov’s reception room, only to get him to sign a piece of paper. Therefore, as leaders of local communities, we sit and think: ‘And what if, after another president comes to power, we will have to sit in the reception room again?’ This is quite normal logic. I, for example, do not know what Yuliia Tymoshenko, or Anatolii Hrytsenko, or Oleh Liashko think. Before the election, they are all tenderness incarnate, they like mayors and the idea of self-government, but we do not know what chimeras inhabit their minds. We do know which chimeras inhabit Poroshenko’s mind, and we can cope with them. The city government has no priorities, we do everything. Speaking about the required traits list, the presence of political will is, obviously, of greatest importance. I believe that if there is will, a lot of problems can be solved. “The city government has no priorities, we do everything. Speaking about the required traits list, the presence of political will is, obviously, of greatest importance. I believe that if there is will, a lot of problems can be solved. We did some things in the legally grey zone, but still saw them brought to conclusion. With political will and determination, one can do a lot. “I am upset by the paternalism of people. Many of them feel that the nation ends on the doorstep of their own home. They cannot agree who will mop the staircase shared by four apartments, or clean it up and take out the rubbish. At the same time, they constantly shout that the government has failed to provide them with something. “The second problem follows from the first one. There are things that can be done through self-organization of people. We already have embryonic forms of self-organization, and we try to stimulate it. There is a municipal program under which we have started to provide people with wheelbarrows, saplings, paint... People come to the city housing administration and say they want to hold a volunteer work day. To do this, we give them everything they need: flower seedlings, brooms, shovels... And this is done at the expense of the city. Thus, we stimulate self-organization. “We brought some people over from the regional state administration, ones we worked with in 2014. These were young lawyers, people who were engaged in bureaucratic work. Another part of the team is made of our party comrades who fought the election campaign with me. But this does not mean that I took people in because of personal or party loyalty, no, they were people who showed professionalism, especially in business operations and in public administration. Thirdly, we also took in young, active citizens and volunteers who were ready to work a lot and work hard. In particular, we brought people from Kyiv, for example Maksym Muzyka came here, and the head of the city health care department came from Volyn. We selected personnel by carefully picking people. These were three main ways. Fourthly, of course, I retained people who were not stained with corruption scandals. There is one Olha Cherkas. She was here during every mayor’s term, even in the Soviet time. When I will leave office, she will keep working, because she is a high-level financier. “The personnel problem is the number one problem for the country. People with business background do not want to enter the civil service. For example, we have the position of the city’s chief architect open, and a famous young architect comes and says: ‘I am ready to work for 10,000 dollars in monthly salary.’ He says so because he earns that much in business. Why should he enter the civil service? We hired recently a young progressive artist Serhii Bilyi. He gets no salary at all. Bilyi says: ‘What use do I have for your 5,000 or 15,000 hryvnias salary? I want to change the city!’ He and his associates draw logos in their bureau, sell them to businesspeople and make good money from it. “When Maksim Kurochkin began his attempt to capture the Ozerka Market, the city was totally horrified. I then participated in the trial on the side of the defense. And at that moment, I realized that it was time to talk about it on TV. But nobody wanted to deal with such things because it was dangerous. Then I went to the Channel Nine, which then belonged to Ihor Kolomoiskyi. I had one condition only – nobody was to interfere in editorial policy. Kolomoiskyi agreed, he never told me what to show and what not to. I paid the editorial team with my own money. In essence, they ‘sold’ airtime to me. “Because there are objective reasons for it. It includes the story about how we transferred the building of Ekaterinoslav Great Mosque to the Muslim community. This is a well-known debate between ‘the voice of the soil’ and ‘the voice of the blood.’ One should not counterpose Lypynsky and Dontsov. This is often the legacy of Soviet historiography. They were engaged in a debate, true, but to a certain extent they were in dialog too. If we are talking about Dontsov, then he was different in different periods. I think that Lypynsky defeated Dontsov, historically speaking. But we need to read Dontsov as well. Incidentally, I have been the only Ukrainian politician to visit the grave of Dontsov at a US cemetery. Apart from me, First Lady Maryna Poroshenko, and Patriarch Filaret, no one has reached this cemetery. “Frankly, I do not remember it. It seems to me that it was so long ago... Moreover, I have such a huge amount of contacts because of my work that I cannot establish lasting relationships with everyone. However, I would like to thank Larysa Ivshyna, for among these tens of thousands of people, she is an ‘anchor’ of sorts which we have managed to get tied to.